Civic Response, in collaboration with the Forestry Commission of Ghana, has launched the Ghana Timber Transparency Portal. The portal is a web interface which makes information on logging in Ghana available to the public via the url: www.ghanatimbertransparency.info. Cutting, transporting, and trading in illegal timber has over the years led to forest destruction, created problems amongst forest fringe communities and cost the Government of Ghana huge revenue loss. As part of solving this problem, Ghana signed a Voluntary Partnership Agreement (VPA) with the European Union in 2009 to ensure that Ghana sells only legal timber to EU and the domestic market. The development of the portal forms part of governance reforms in the forest sector resulting from the VPA. The Ghana Timber Transparency Portal provides information on the various valid logging permits, timber logging companies and their areas of operation, information on exports of timber from Ghana, as well as other periodic reports that are generated from time to time. This public portal links to the electronic Ghana Wood Tracking System (GWTS), which is a complete database of information on timber production process in Ghana. The portal is expected to be subsequently expanded to include other relevant public information on forest management and timber logging in Ghana. Delivering the keynote address at the launch, Deputy Minister of lands and Natural Resources, Benito Owusu-Bio noted that the portal will make Ghana’s FLEGT licence process credible. “We are at the verge of exporting FLEGT licensed timber, the climax of the FLEGT VPA journey. 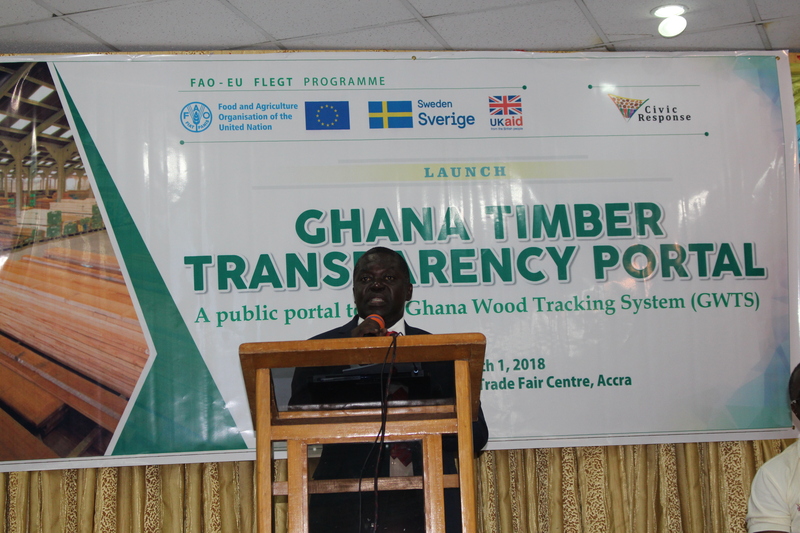 The Ghana Timber Transparency Portal offers us the opportunity to demonstrate the transparency, credibility and integrity of the FLEGT licence issuance process,” he said. Making a statement on behalf of Civil Society, Co-ordinator of Forest Watch Ghana, Samuel Mawutor, also said that the portal will facilitate CSOs’ efforts towards working to ensure improved forest governance. 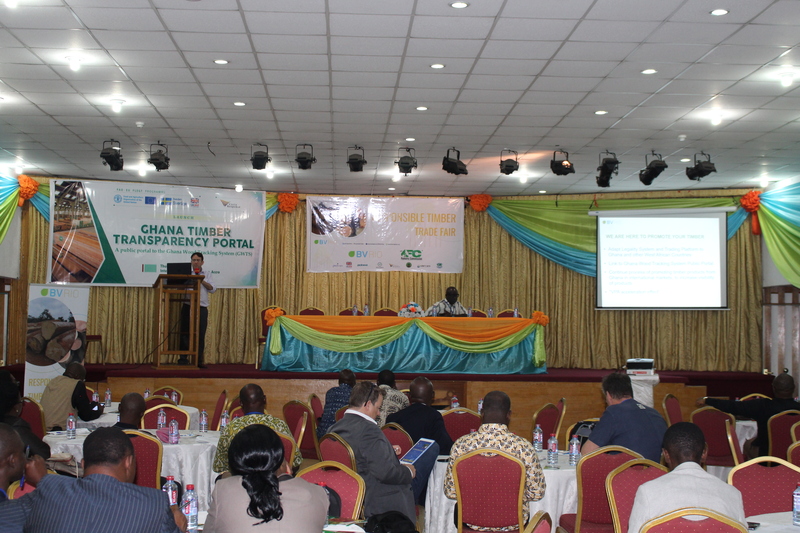 “This portal presents a tool to provide better and credible feedback to forest managers and to track the progress Ghana is making in reform forest governance. It also presents Civil Society the opportunity to track the commitment of the Forestry Commission to improved forest governance and it its own charter,” he said. Mr. Mawutor also commended Civic Response and its partners for working together to develop the portal and made the assurance that Civil Society would use the portal to improve awareness of local communities and the public on forest and legality issues in Ghana in order to ensure Ghanaians become better stewards of the nation’s forest resources. The Ghana Timber Transparency Portal was developed as a result of collaboration between Civic Response (a leading natural resource and environmental governance policy advocacy organisation in Ghana) and the Forestry Commission under the auspices of the former’s Civil Society-led Independent Forest Monitoring (CSIFM) Project with funding from the EU, Swedish International Cooperation Agency and UKAid under the FAO-EU FLEGT Programme.